Locanda Daniel i Firenze, Italien: Reservér nu! 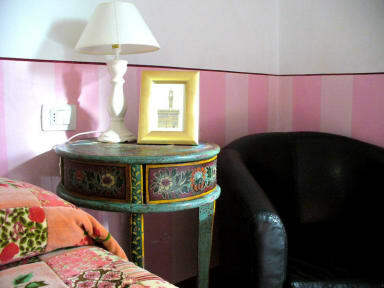 Looking for a cozy little place to stay, right in the heart of Florence? 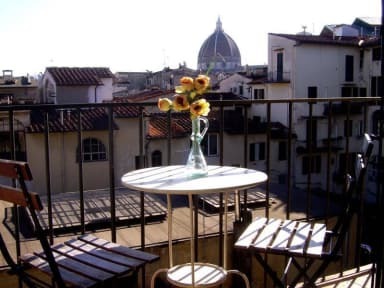 That's Locanda Daniel: warm atmosphere and amazing VIEW of the Duomo! We are right in the middle of everything: 5 minutes on foot from the central train station of Santa Maria Novella, and within walking distance form ALL the must see places. The common area is equipped with fridge, microwave, kettle, internet point, Touch Info Point h24 and a lovely terrace with a table, to enjoy our grate view over the Duomo and the florentine rooftops.
. Touch Screen Info Point h24, updated and geolocated informations about Florence and Tuscany...one of the very first devices in Florence!! Our check-in time is from 9:00 a.m. to 1:30 p.m.: let us know your arrival time, if it's needed we will provide entrance codes for late check-in. We are at the 3rd floor with no lift, but with a grate view.